You will love the updated decor throughout this open and light home. Entirely updated kitchen with exceptional cabinets, countertops, appliances, travertine backsplash and tile floors. New paint throughout. The living room features an extra high vaulted ceiling and Lots of light plus auto-ignite fireplace. First floor also includes double garage, half bath, and kitchen and dining room that walks out to the patio. The second floor features a nice size master bedroom with double closets and private bath, hall bath and two additional bedrooms. 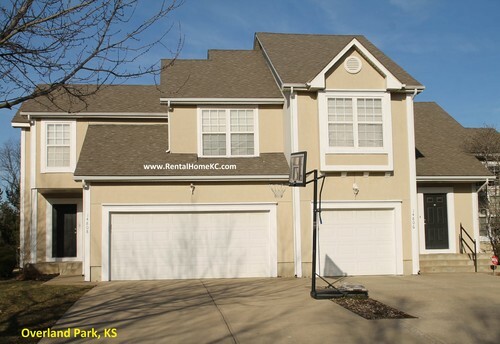 This home is located on a beautiful lot that backs to trees and a walking trail, just west of Metcalf between 143rd and 151st streets. SHOWING NOTE: This home is currently occupied so showing times are subject to approval by the current tenants.